In a world like ours, filled with uncertainty, never has the human race needed so much reassurance. In the face of a plunging economy, not just of the nation or its industries, but also of families and their individuals, fear seem to have become a way of life. In all of this, what does God hold in stock for His own? 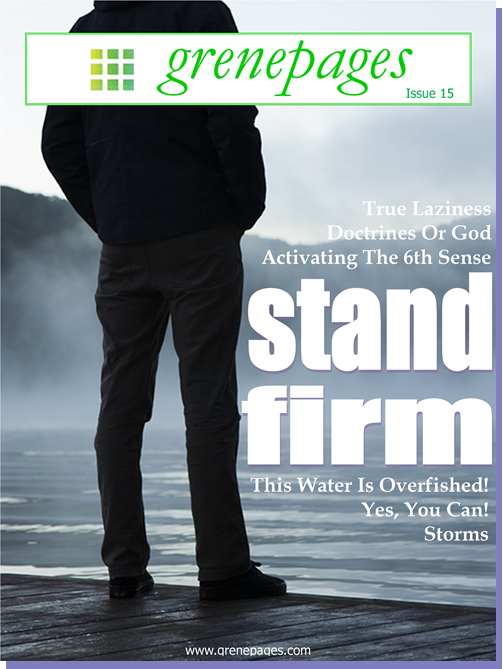 Ibukun’s Doctrines or God, Tosin’s Activating the 6th sense, Joan’s Storms, Ope’s Overfished Waters, Tobi’s True Laziness, Femi’s Yes You Can are all put together in this 15th issue of grenepages to bring the message to you. You can STAND FIRM like Mount Zion that cannot be removed, come what may. This entry was posted in grenepages and tagged editorial, issue 15. Bookmark the permalink.